Consternation or concern..will I use it or discard it? When making this block and several others I didn't realise that the triangular middle would mean that the block would sit better on point. However in Raconteur the individual blocks are actually sitting flat. when I at first realised this I had already made about ten or so blocks as so had to decide replace them or leave them...... I was feeling lazy at the time and so they remained. Rosemary has set up an album in the QDU website for anyone not having their own blog. 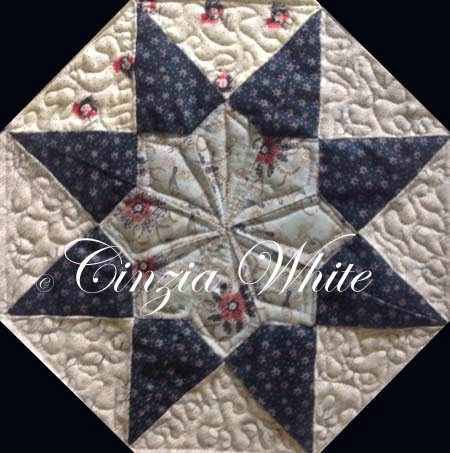 Anyone can add their photos to the album as they complete their free motion quilting targets. Click here to go directly to the FMQE photo album. Oh just thought you need to be a member of QDU to access the photos and to post. If you're not yet a member you may participate through here but you will miss the chatter etc which comes through the yahoo group. A simple solution is to join QDU. I think this link will take you to the sign on page. If not then google yahoo groups and QuiltersDownUnder, all one word with no spaces, capitals are optional. It may take a day or two before you are approved as it is now the Xmas break so don't think you are being ignored. So what does FMQE stand for? 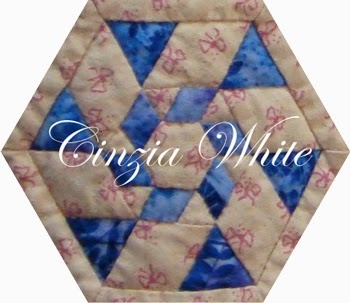 One of the online forums to which I belong is QDU, which is short for Quilters Down Under. 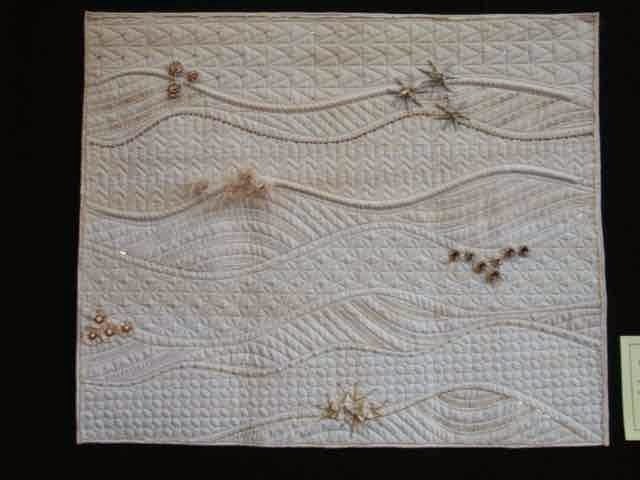 This is a Aussie based quilting group on Yahoo. 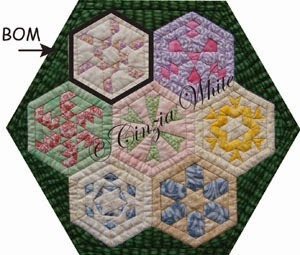 A few days ago talk came up about free motion quilting, so there you have the FMQ bit. 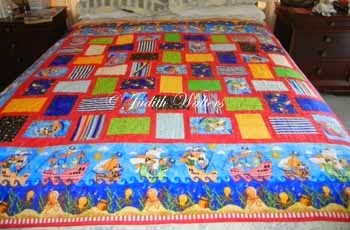 3. even more unlikely than that lotto win was the possibility that one morning we would wake up and miraculously we'd be fantastic free motion quilters....definitely in everyone's dreams! So in the hope of increasing the likelihood of option number three we have decided to join a FMQE, or a Free Motion Quilting Extravaganza. So how does it work. There are a few things you need to do .... do as few or as many of these as you wish.... It is totally your journey..... it's just a few of us want to tag along. 1. on the 1st and/or 15th of each month you decide what you want to do to help option 3 eventuate. It is only a target for what you wish to accomplish in the next two weeks or month. 2. Write a post on your blog saying what your target is. Set it up so it appears on the 1st and/or 15th of the month. If you don't have a blog you can always write your target in the comments or email them to me and I will post them here for you... hopefully also with some photos of your fantastic work. 4. In your blog post tell us what source you used so if people want to follow it up they can. If it was on the web plz provide a link to it. 5. Give any hints you've worked out to make it easy for the next person. 6. Add a link to your post in the widget box on my blog so others can quickly find your post. I will clear out old links a day or two before the next posting day. This gives people a central location for checking all of the FMQE. You can add the linky list to your blog by clicking on the blog hop link and copying the code. 7. Enjoy yourself...remember to improve you need to do a bit regularly .... Remember when you first started writing. You had to keep practising and thinking about it. Now it's automatic. How easy is it to write your name......using your non-dominant hand ....... upside down......and back to front? I can manage the first three of those tasks without thinking but the last is not so easy.... I need to practise. 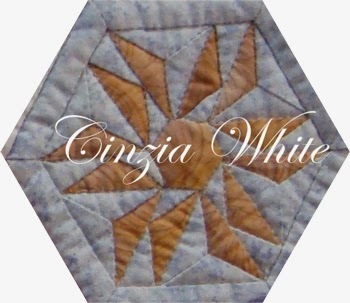 OK so now you can see why I thought the previous pale blue border was OK. 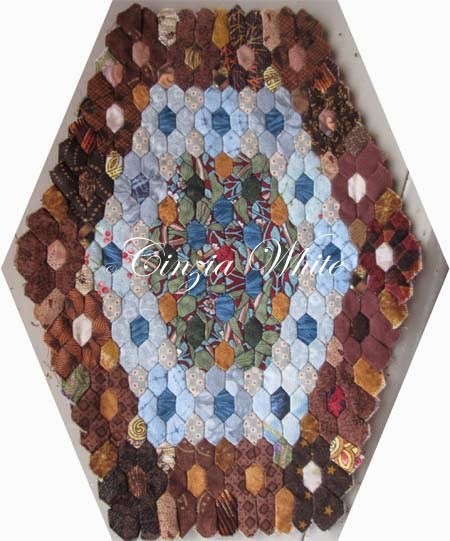 It makes a superb buffer between the two brown layers don't you agree. Well success and now to move along to the next blue border. Everyone likes success. 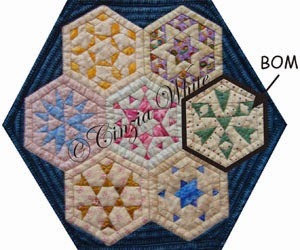 Anyway here is Mary with the second last hexagonal border., only one more to go and then it's onto the straight borders. So what has Mary Prince been doing lately? Not a lot as you can see. 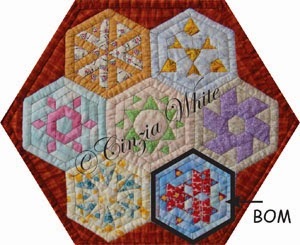 I finished the centre and then redid the first blue border changing the pale blue floaters for dark maroon and olive green. Although before attaching the blue border to the new middle I felt they were great floaters I'm no longer so sure of that. I wish I had remained with the scrappy look. This colour coordinated isn't as easy as it looks. Well here it is the latest middle. I know you will probably find this easy to believe but I did actually make up both of the middles from my previous post and neither was quite right. A few more trials... oh if only the sewing could be as qick as the photographing... mind you I don't always have a charged camera with which to take a photo so you have missed out on seeing several of my trials. I think I have more time than sense as they say. I bet if I went up to a 50c piece it would dominate the photograph. Well have finally returned from Houston. 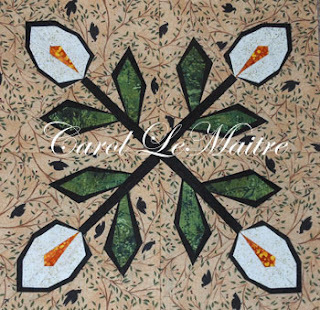 Fantastic quilt show and a definite must if you ever have the opportunity. Will upload some photos when I get the chance but tonight just thought I would tell you abut our flight home. Paul had figured that two days would be enough and so we flew into Houston Wednesday evening, spent two days at the show and then went off on a cruise around the Caribbean. If you ever want to pick up a cheap cruise leave your booking until a week before it departs.. we scored over 80% discount which isn't to be sneezed at. At the end of the cruise all that was left was the long haul flight home. Paul has these over to counter antihistamines which they say sometimes may make one drowsy. Well they totally zonk me out. Anyway as we had to fly from LA to Sydney I decided that I may as well have one and get some sleep. Don't know how long I'd been asleep but I semi woke up when I tried to get a 'comfortable' position. Lights are all on rather than dimmed as per usual but I think little of this and go back to sleep. I repeat this again sometime later and as I move Paul tells me that we are going to have an emergency landing. As I roll over I think, 'Thanks, just what I want to know when I can't swim. We are going down and I'm going to drown!' I then promptly fall asleep again. I told you these tablets are lethal. Sometime later I again wake as I roll over, plane seats in economy have never been known for their comfort. Paul says we have landed in Hawaii. This wasn't on our flight plan last time I'd looked but I figured at least I hadn't had to swim. I roll over and go back to sleep. He doesn't believe the bit about not getting any sleep as I managed to sleep almost the entire 18 hour flight... it was supposed to be 14 hour flight. As it turned out there had been a medical emergency. Announcements had been made regularly over the intercom, first asking for any doctor on board and then informing passengers of the emergency and need for the diversion. This forced them to divert to Hawaii where paramedics came racing down the plane and carried this little old lady out. She was seated about five rows in front of us. After which we had to wait for the plane to be refuelled and then continued to Australia. As they say another day another colour change. 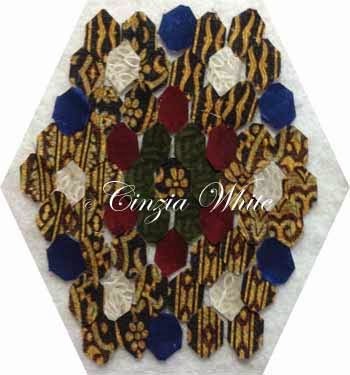 I have decided that perhaps my problem lies in the middle of my block so am trying some new middles. Hey I have already redone both the first blue and first brown border three times so it's time to try changing the middle. Boy am I glad this is only a miniature! Anyway which one do you prefer? 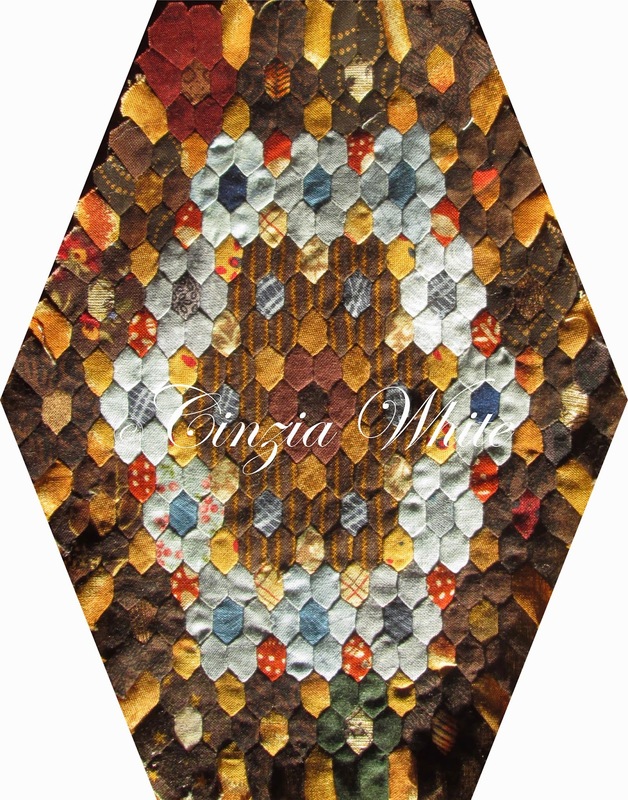 Don't you like making group quilts? 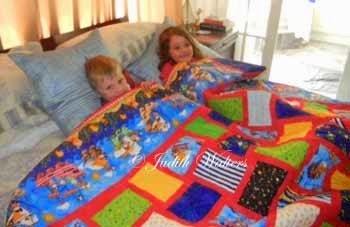 They get finished so much faster than your own quilts. Well when I put it like that I suppose I should say 'they get finished' period! 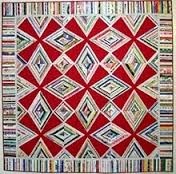 This quilt was made by the Red Berry Quilters and will be their raffle quilt for next year's Berry Quilt Show. I'm not sure but I think it will be in April as they have decided to move it from the original date as someone had already booked the hall. 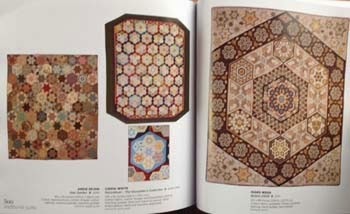 There will be some really beautiful quilts on display so keep April free. I will let you know the actual date as soon as I know it. Btw if you would like a copy of the patterns for this just click on this link for a pdf of the foundation papers. 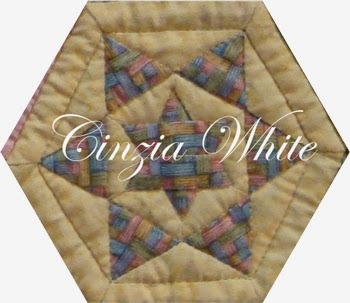 You will find there is also a second document for completing the border stars that although were in my original design they decided not to use. Send me a photo if you decide to make it. Well it definitely looks like this little fellow is ready for the winter. Pity he didn't prepare ahead of time and flown south then he wouldn't have needed the hat and boots. 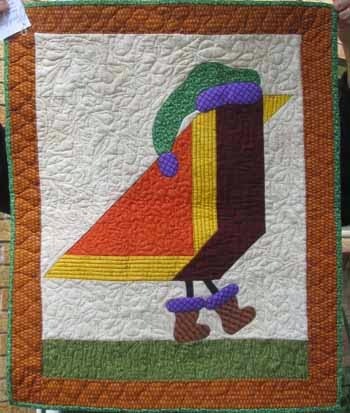 He is a funny fellow and I found him in Quiltmakers 100 blocks volume 9 I think. I can't find the magazine otherwise I would also write down who the designer is. She created a little beauty. It's funny the things we learn and remember. When I was only a littlie..yes I know it was several years ago but anyway at that time all of our books were published in the northern hemisphere .. or at least I believe they were. So why do I have this belief. Well it's the bit about birds flying south for the winter. Now I live in Australia and the only thing south of here is Antarctica and even as a young child I knew it must be pretty cold down there in the summer and a lot worse in the winter so why were they flying south. Well I was also a very well behaved child and so I NEVER dared to question those who knew more than me and so I held this belief for a long long time. Wouldn't you like to make one or two. 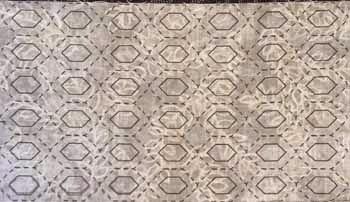 Very cheap in fabric. 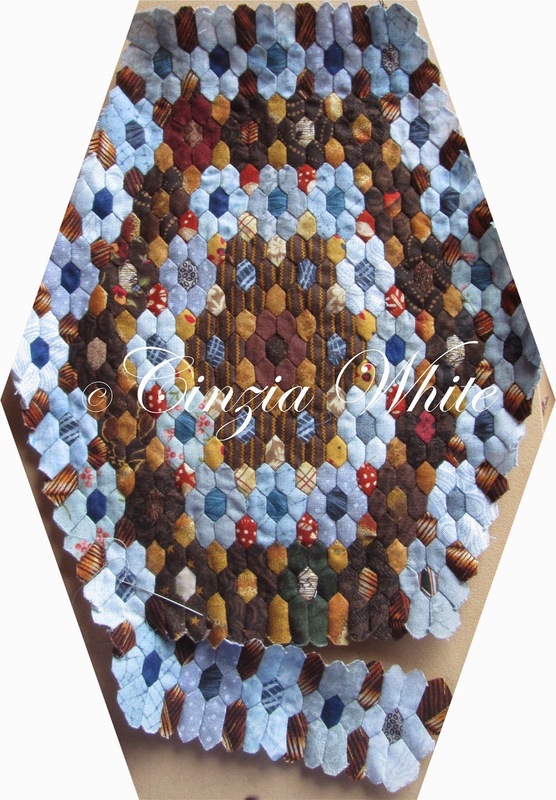 A 4 3/4in x 7 1/2in rectangle of fabric fits 42 hexagons. How do I know this? 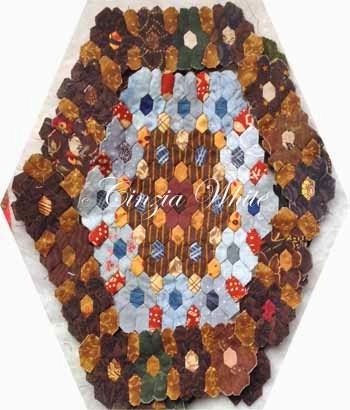 Simple because rather than using English Paper Piecing, which btw is now known as mosaic quilting/piecing, anyway rather than using that I'm sewing Mary Prince the old fashioned way of sewing along the seam line. Making it modern rather than drawing my own sewing lines on I'm printing them. It is really easy. 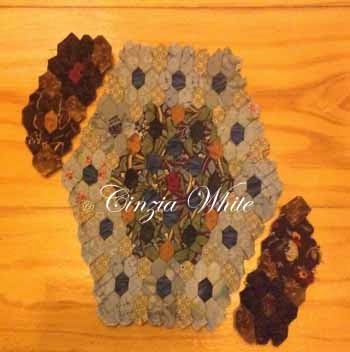 Once you have the file all you need to do is iron your fabric SECURELY onto a piece of freezer paper then send it through your printer and viola you have a piece of fabric with both the sewing and cutting lines already drawn on them. A lot faster than either EPP or drawing on your lines the old fashioned way. 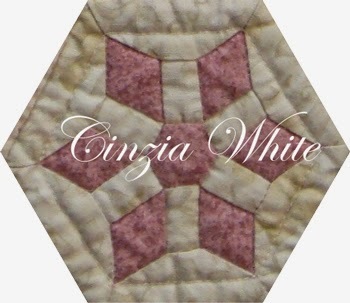 Don't the small floral fabrics used in this block remind you of the times as a child when you held some long ribbons in your hand as you ran around and they fluttered in the wind behind you? 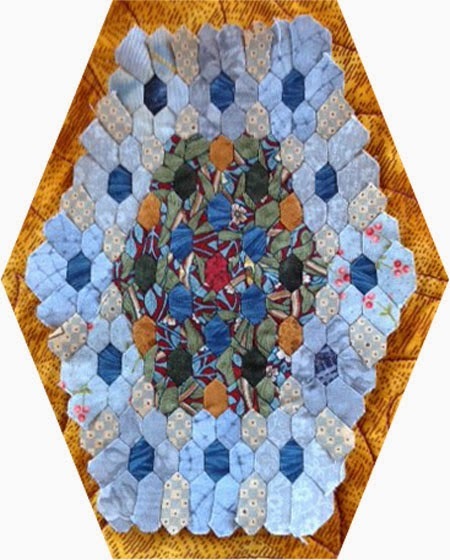 OK well for the big news tomorrow is the opening day of the Houston Quilt Festival. 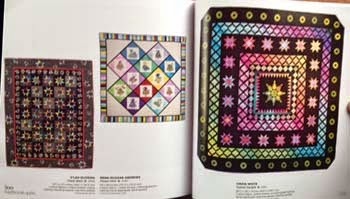 It runs from 30th Nov to 2nd Nov and I have been invited to display two quilts there, Turkish Delight and Raconteur. So to celebrate anyone who reads this post may have 30% of any item from my website. Simply write Houston in the coupon section when checking out. The code will be valid only while the show is on so don't loiter. If you are collecting the monthly featured collections why not pick up next month's with the extra bonus. Well I have been active but unfortunately not always successful with the designs. 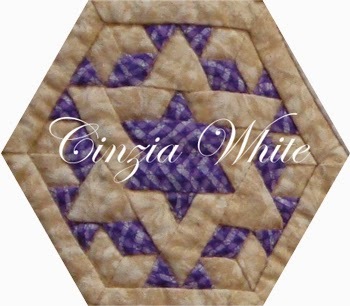 I added my next border on deciding that the light one was the way to go. 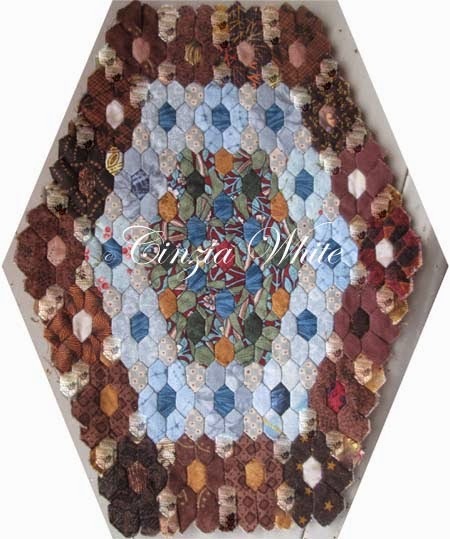 However as you can see the light coloured hexagons are just too stark and stand out. 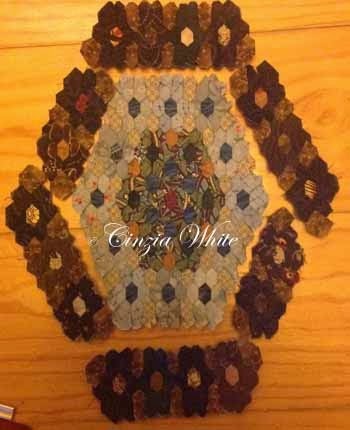 At this stage nothing goes together and all you can see is a blob in the middle followed by at dark border with white blobs in the outer border. Not happy. So what was the solution? 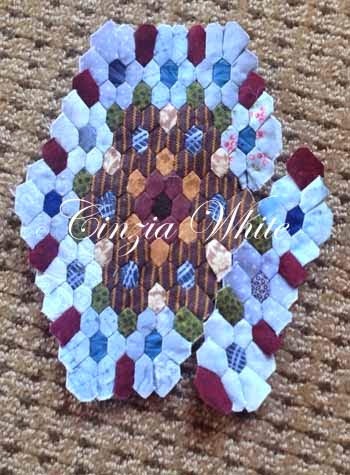 Well unpick the outer border...why not it only took me about a week to sew it on and not surprisingly it took almost as long to unpick. Next I decided to try a darker brown. when I started it looked good and also in the sunlight ....but..
in any other situation it looked just too dark so back to frog stitching. It would be lovely to say it gets faster as one goes but it doesn't. 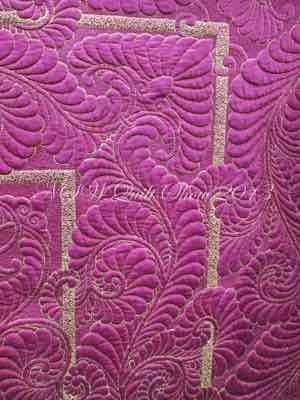 Although each seam is only 1/4in would you be surprised to learn there are three or four stitches on each of those. I'm glad this time I hadn't actually attached the border. 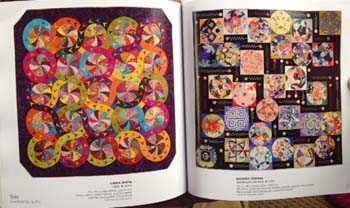 I am very fortunate these days that Elaine the editor of Australian Patchwork and Quilting likes my designs and so regularly publishes them. 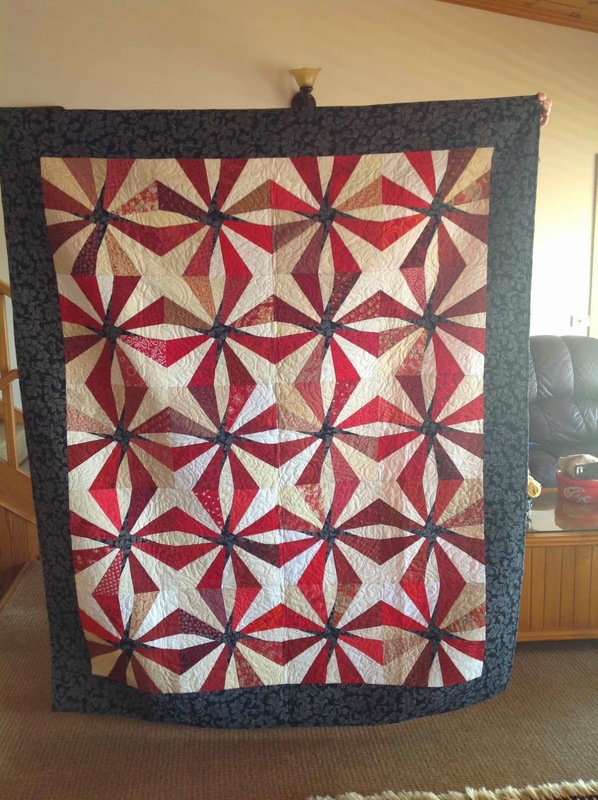 I am also fortunate that sometimes people who make the quilts send me a photo of their finished quilt. 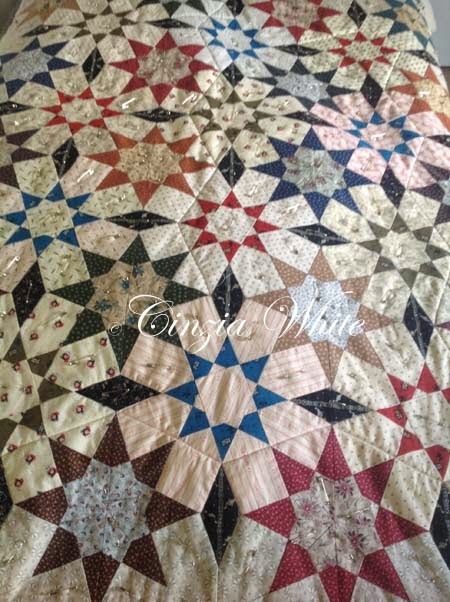 A few days ago I received these photos from Judi Walters who decided to use Valiant Frogs from APQ Vol 19 No 12 to make this gorgeous quilt for her grandson's third birthday. Isn't he cute and I assume that is his big sister who is also enjoying the fruits of grandma's labor. Isn't it a great border? Well how successful were you? You must admit that Megan does have a sense of humour though. 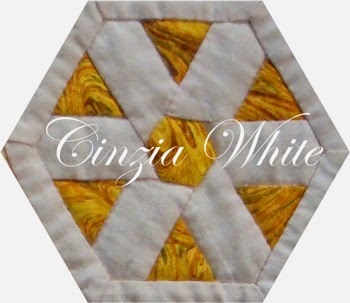 Are you going to show this to your quilting group? I'm saving it up for next year's retreat. Will have to find a suitably humorous prize for the person who guesses all of them. 3. Design wall..... wonder if Don could come around to my place. My flannel sheet could do with an upgrade. 4. Selvedge ... there are some fantastic quilts around made with these, check out this link for a few. 5. Batting . this one didn't make sense to me so I can't add extra explanation. 6. 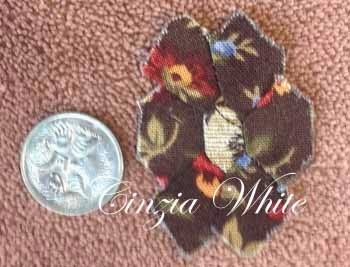 Quarter inch seam. 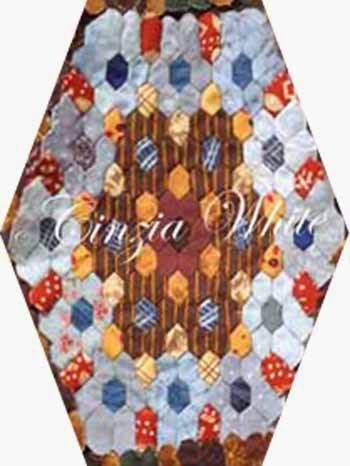 I also usually go for the close enough is good enough school and have found that this only seems to have an impact on my miniatures... with a large quilt those few extra inches gained through the not quite right seam allowance actually make the quilt just that bit bigger that you needed. 7. Fat Quarter ... mind you it's not the potato salad that is the culprit here...chocolate leaves it for dead... I have been on a diet since yesterday and all was well except for the rocky road I ate while out doing some business this morning. Must admit diets are a killer. Where I can usually stretch a rocky road out over a few days when dieting the whole thing needs to be eaten in one go so that all evidence can be destroyed before returning home. 8. 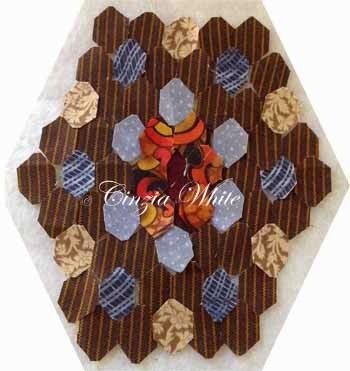 Quilt sandwich... you know the backing, batting and quilt top. 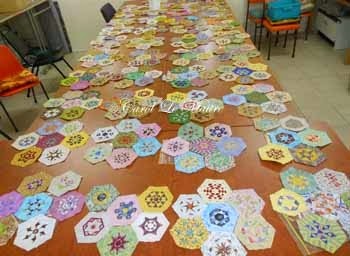 These are all held together after basting with safety pins for several years while you consider the best way to quilt it. After a timely delay, while waiting for the non eventuating lotto win, you need to finally bite the bullet. 10. Squaring off. 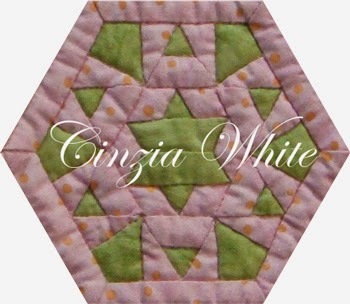 Can you please explain why when I square off one corner and carefully wormy way around the quilt edges the final corner is never square and that side is also a different length to the opposite one. I was once a maths teacher and by all of my calculations they are all the same. Perhaps, no definitely, it is the fault of the tools. 11. Applique - must say that adding appliqué in my mind is a fool's method of escape, it always creates more problems... what's wrong with changing to art quilt.. holes are allowed there. 12. HST aka halfsquare triangles... note the use of the word square is not quite right here but the idea was there when you started this quick project. 13. Flying Geese... although I enjoy this block I must again agree with Megan's opinion. Unless extra seam allowance has been added into the process there is no way that all of those points aren't going to be squared off. I suppose it's due to the geese flying rather than sitting. 14. 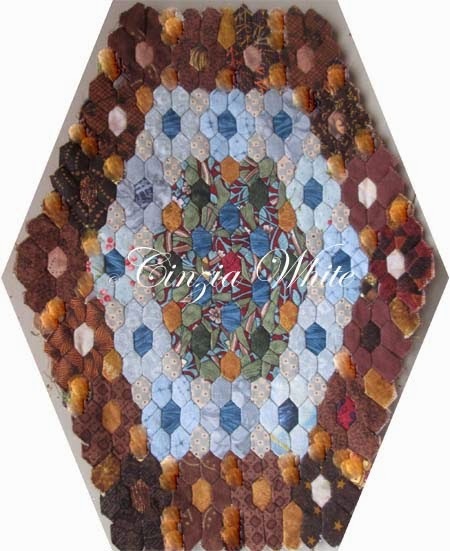 Self-healing mat.... and have you been looking after your mat properly. Did you realise you are supposed to soak it regularly in a solution of 1c of vinegar to a bucket of water. If you have a huge mat then you can do as I do. I place a solution soaked towel in the shower recess, place the mat on top of that and then place another solution soaked towel on top. this should be done regularly, which in most people's case I figure once a year is a lot more regular than previously so is a good starting point. 16. Mitre... I didn't this one either and even though I checked the schedule of events at the Mardi Gras was unable to find it. The quilting fraternity in New Orleans is probably a bit like the Masons... a secret organisation that never tells of their plans. 17. Grain line.... yes you know that thing that is supposed to be straight but unfortunately often resembles that Jack Daniels line when buying the sixth or seventh round. How many have you managed to get now..... answers provided tomorrow ... or perhaps day after as I have a lot on my plate tomorrow. 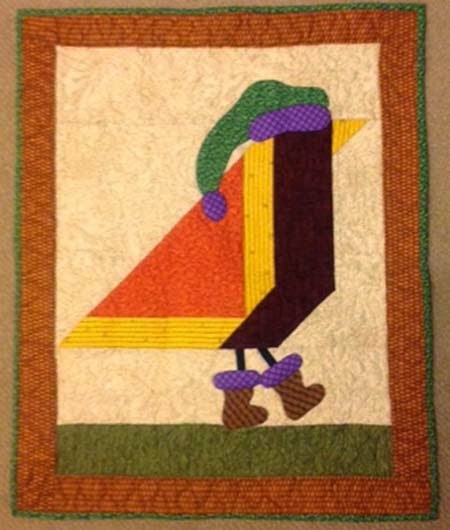 Earlier this year Carol entered this block into the Quiltmaker's 100 Blocks celebration edition which was to mark Issue 10 and 1000 new blocks. Well she has now heard that her block was selected and so another Aussie designer hits the international stage. 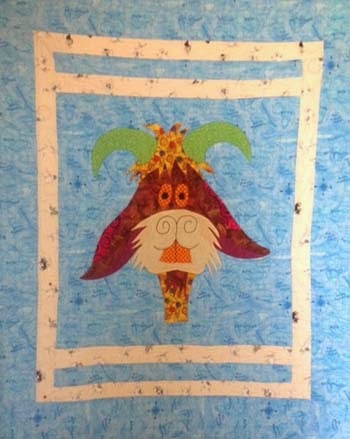 Well this quilt was started over four years ago. 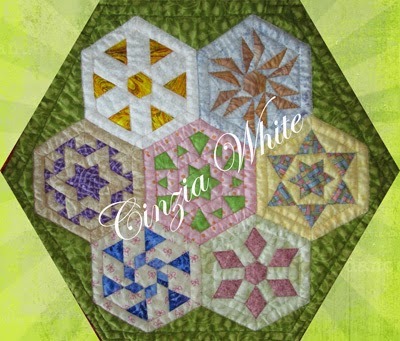 I designed the block for Volume 3 of Quiltmaker's 100 Blocks series and just loved it. 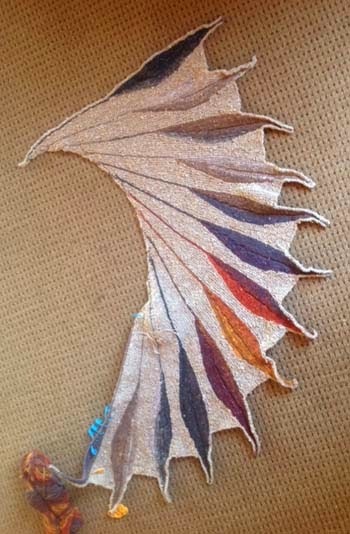 I had just heard of a method for drawing the cutting and sewing lines onto the back of the fabric using my inkjet printer and thought this ws the perfect opportunity to try it. That worked out well and the fabric was marked and cut out in under a week if I remember correctly. I then took the project with me overseas and had a perfect take anywhere project while travelling around. It was that Xmas when airports all over Europe were closed due to lots of so now. My first and hopefully last white Xmas... the theory or idea is great... the actuality is cold, wet and slippery. Wonderful from inside beside a warm fire. 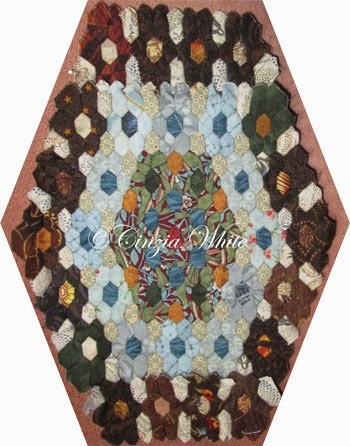 Anyway finished the quilt top fairly quickly, then basted it and there it has sat waiting for a l...o...n...g time. 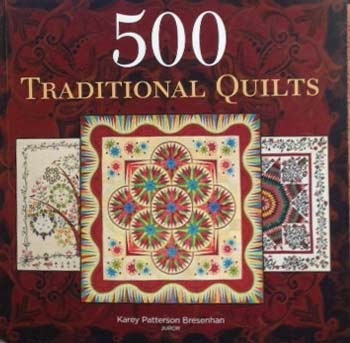 This year is my adventure with free motion quilting and after a few successes, with baby sized quilts it was now Khanam's Surprise's time. 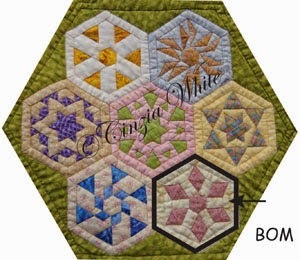 I have decide that I will stitch an octagon around each star and then free motion inside the octagon to highlight the star. Here is attempt number one..... I will keep you posted in my progress. Collection 23 - Where Did That Name Come From? Didn't we all love Lime Sundaes when we were young....or did you call it a spider as my friend Terri does? No idea where the name Cotton Spice came from. It just seemed right. Sweet Caress doesn't the title just bring back those delightful memories of being wrapped up in your true loves arms...and I don't mean it so sound soppy either. 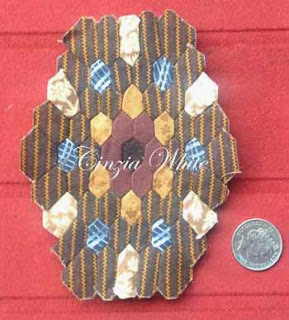 Those pieces were so small that there could be no better description than Itsy Bitsy. As a child I loved ribbons and even these days of all the rhythmic gymnastics events the ribbons are my favourite.